The history of Rajputs has been one of great courage and bravery in wars against invaders. Courage is intrinsic to their identity and to this day, no Rajput wedding is complete without a majestic display of elaborate weaponry. Nothing beats the grandeur of a Rajput, all dressed up in the royal finery, carrying a shield and a sword, richly embellished with gold and silver. Even though today, traditional weapons of warfare have become obsolete, they still hold an important place in the community of Rajputs. Weaponry is also consecrated during the festival of Dussehra. At such occasions, one can see swords and shields, coat of arms, armours and knives, in their full glory. 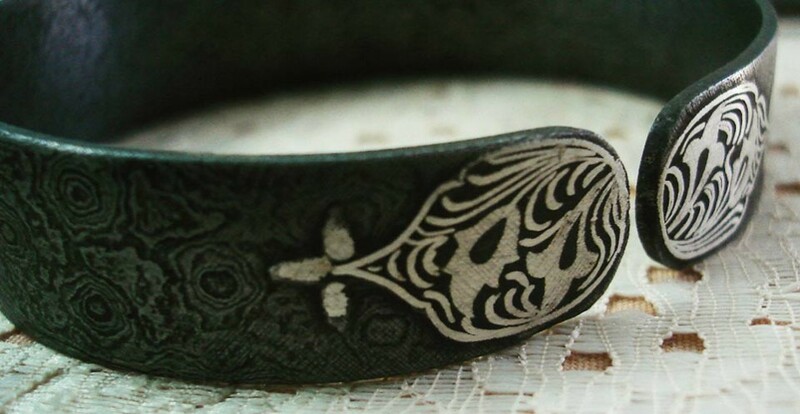 The sheer strength and power of a Damascus steel sword, its dark grey colour and majestic form are beautifully completed by intricate floral motifs drawn with glistening precious metals on its sheath and richly embossed hilt. 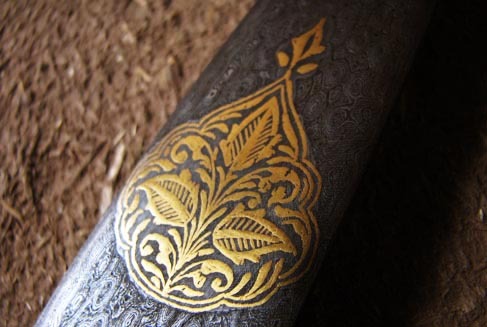 Ornamentation on armament was integral to Mughal and Rajput cultures. 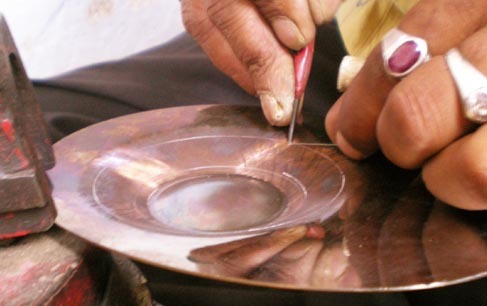 Traditionally, the Siklikar community has been practicing this craft in Udaipur, Rajasthan. 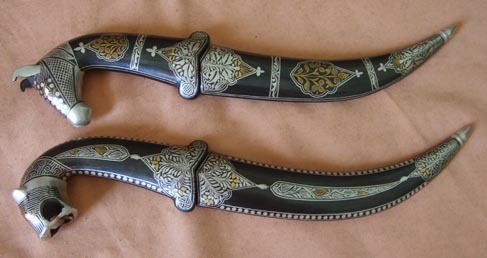 The base metal, usually Damascus steel, is first scratched all over its surface with a knife (known as chirni) in a very close cross-hatched pattern. These fine scratches help in holding the inlay metal securely. With just a few guidelines marked on the surface, craftsmen start laying thin silver wires for making outlines of the patterns. 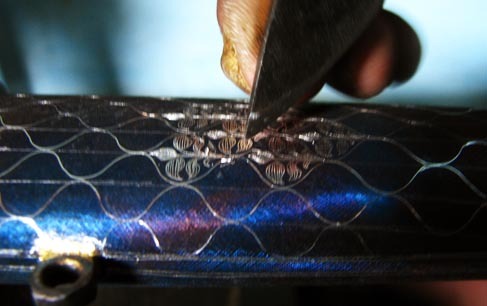 Pressing the wires with a pointed tool called “salai” fixes them in the etched grooves. After the outlines, the main motifs are made and then filled with closely placed gold or silver wires. Deft fingers place the fine wires of silver and gold with such precision and fluency; it is difficult for a layman to even draw with such skill on paper. Motifs so exact, it is as if made by a block and repeated to get a web of identical patterns. Once the motifs are filled, the outlining silver wires are removed and melted for reuse. The article is then heated and rubbed with hakik stone (agate) for a polished finish. 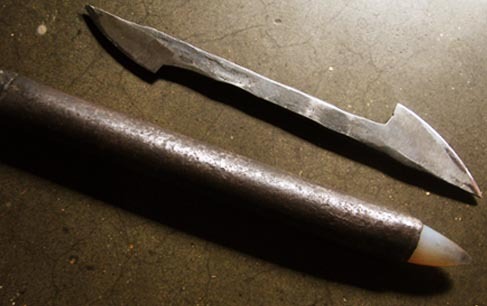 Earlier, kings would commission the embellishment of ritual weaponry to craftsmen who would let their imagination take a flight to create something the king had never seen before. The only brief was to make something so amazing that the king would be impressed. Craftsmen would then take inspirations from scenes of royal processions and hunting excursions and translate them on to the weapons used in those occasions. Motifs can cover a wide variety of subjects, from flora and fauna, to gods and goddesses, to scenes from the lives of kings. A strong Mughal influence is also seen in the designs. Designs with both gold and silver wires are known as “Ganga – Jamuna” and the ones made with gold-silver alloys are called “Hara Sona”. Craftsmen are now giving new directions to this art, by ornamenting objects of utility, such as vessels, mirror frames and even jewelry. But souvenir weapons like knives and daggers remain most popular, reinforcing the status of this magnificent craft in regal finery. While some crafts belong to the commoner, inseparable from their daily lives, there are some that are brought out only at the most grand, festive occasions. 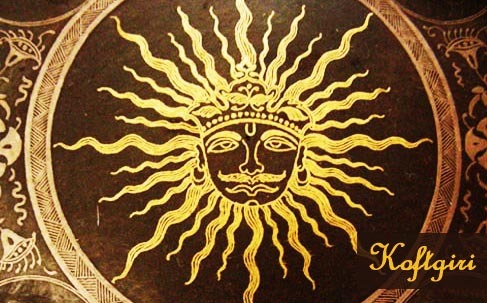 Koftgiri is one such magnificent craft that is truly majestic and royal. i am from udaipur,i provide all the informetion about damascus and koftgari,but nathing any informetion about artisan,it is semful and near future will near intertain your students and any particulsr parson.